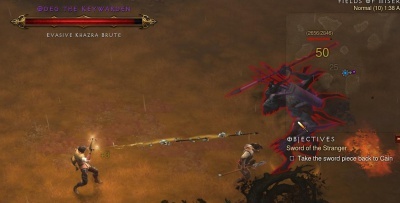 Odeg the Keywarden is a Unique boss added in Patch v1.0.5. This monster can be found somewhere in the Fields of Misery level in Act One. On Inferno difficulty Odeg has a chance to drop the Key of Destruction, an item required for the Infernal Machine end game event. Odeg is an extra large spear-throwing two-headed Goatman with various boss modifiers. He is Molten and also Jailer, with a Knockback effect on his hurled spears. Players who are not geared well enough to simply blitz him would do well to stay ahead of him to avoid burning too badly in his Molten. Though he hurls his spears at a faster pace than other Goatmen, ranged attackers can avoid them by staying at least half a screen away (about 40+ yards) and sidestepping a bit after every shot. In addition to possibly dropping the Key of Destruction, Odeg drops like a random boss monster, and will usually drop several blue items as well as two or more Rares. Legendaries can be found from him and the other Keywardens as well. Obtain the three keys and the Infernal Machine plan which you must teach to the Blacksmith. Craft three keys, one of each, into a Portal Device. (You can make multiple Portal Devices. The Realm of Discord. 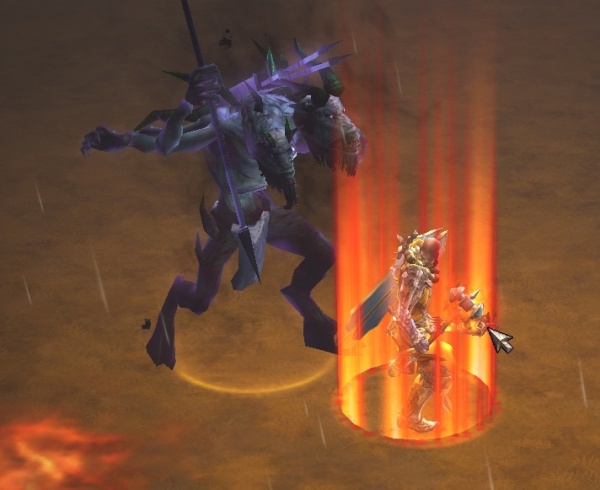 Battle Uber versions of King Leoric and Maghda for a chance to obtain the Writhing Spine. The Realm of Chaos. Battle Uber versions of Ghom and Rakanoth for a chance to obtain the Devil's Fang. The Realm of Turmoil. Battle Uber versions of Siege Breaker and Zoltun Kulle for a chance to obtain the Vengeful Eye. Note that steps 1-3 must be repeated multiple times, since you must create at least three red portals to obtain all three demonic organs. Furthermore, unless you are playing on Monster Power 10, the keywardens do not always drop keys and the Ubers do not always drop the demonic organs. Their odds are 5% on MP0, 10% on MP1, 20% on MP2, and so on, increasing 10% per MP level, until 100% at MP10. This page was last edited on 8 April 2015, at 12:04.